So many stalls to choose from, which one should we choose? This entry was posted Wednesday, May 4th, 2011 at 4:41 am and is filed under Audio, Matters of National Importance, the mrbrown show podcast, Podcast. You can leave a response, or trackback from your own site. mrbrown, your MP3 should be dated 110504, to the correct year, and not 140504. One for the history books. 2006 Bak Chor Mee. 2011 Teo Chew Muay! Mr Brown, you sure this is not another persistantly non political podcast or not? If it is must tag as such hor. Otherwise cannot be free to un-comment on erection OK? This is another classic. I just wish you can do podcasts every day from now on…. amazing what you can do with the same context but just a different shell. brilliant! can we have a sorry sorry sorry parody!??? 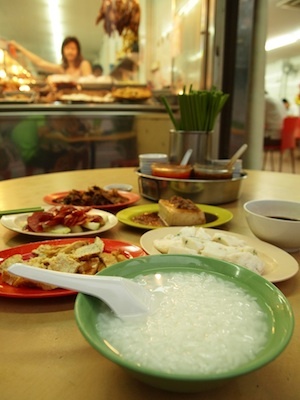 so happen Aljunied GRC has lots of darn good Teow Chew Muay Stores! Wah, next time can be expand to whole Food Court story hor. This is the BEST EVER!!!!!! Thanks and Kudos to Mr Brown and company! hahahahahah !!!! damn good pei pei !!!! This is the bak chor mee sequel we have been waiting for! Yes, I would like some Teochew mueh and Nyonya kueh for lunch too. YA! you never try you never know. my family like pernaraken food also! Haha MrBrown i just came to know about your website, but so far it has entertained me so much that i regretted not knowing it earlier!!! Really clever guys, I wonder how the public will choose to ‘dine’ come election time. Since I picked up “today” many years back, where I first read your column, you have always been so entertaining. This one takes the cake for being the best summary about the GE so far. That’s one damn classic podcast coming out every 5 years!!! Laugh until tak boleh tahan. Mr Brown, you never fail to amaze everyone everytime. Eagerly waiting for your next podcast. this is simply brillant mr brown. You are very creative Mr Brown…. My hawker centre does not sell Teow Chew Muay but they have Chee Cheong Fun. So we will have breakfast on Saturday with lots and lots of chilli. I always like Teochew Muay better than Bak Chow Mee. It’s more healthy and not oily or fatty. 清淡。Plus so many variety and can share with family and frens. And is value for money. I vote 5 chopsticks out of 5 !!! Totally Hilarious! Good one Mr Brown! All the opposition parties should play this podcast at everyone of their rallies. Bloody hell Mr Brown! You damn tok kong ah! (compliment). It takes a Singaporean to understand this podcast - so funny…… btw, u forgot to add the elements of Grading A, B or C….. A = ASIA, B = BuaySIA, C =?? This is really the best ever! OMG! I live in Marine Parede, I will definitely try the Peranakan kueh served by that young, pretty and smart Nonya girl! This is good man… I like the freak event! i like the “peh peh”… BEST! Awesome! I remember “why you so like that” wonder if you guys can bring that back? Like many, I will be trying something else besides bak chor mee….once again awesome guys….Power to the people! this time should be going for some teochew muay for me.. Finally I still get to enjoy the teochew muay. Well done teochew muay uncle. After the teochew muay, maybe should also have some rojak… healthy living.. I love IT! So accurate and creative! Most people went for BakChorMee last weekend! Singaporeans are not adventurous when it comes to food lor! & apparently don’t really like rojak, be it Chinese rojak or Indian rojak! sad….sad. your fans are rite…all opp parties should have played your creation (& rojak stall should be included too lor!). Itz a pity many Singaporeans not bold enough, too fearful, too short-sighted & not thinkers…only 9 news stalls are allowed (there is even a ceiling for number of new stalls; pretty democratic; hahaha) . GREAT JOB, MR BROWN & GANG! The grass on the other side of the fence is greener. Try KL, they give you more! But not much of your choice. The ‘chiobu’ (pretty) helper, Nicole, in the podcast refers to Ms Nicole Seah of the National Solidarity Party who contested and lost to PAP in the Marine Parade GRC.